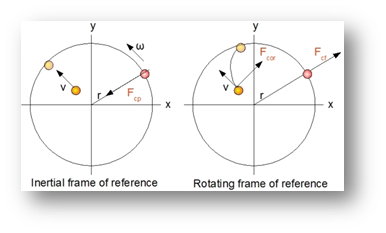 In rotating frame of reference which is considered as a special case of non-inertial frame of reference rotating relative to an inertial frame of reference. In this case the frame of reference is accelerating with respect to an inertial frame just a boy is rotating a stone tied to a string. – It is a force that comes into play due to the body’s inertia acting outwards in order to oppose the circular motion of the body. 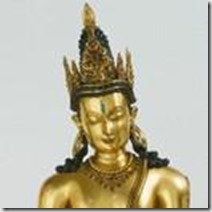 – It is a fictitious force that appears to come into play due to the rotation of the earth. This force is briefly discussed in this article. – It is a tangential reactive force of angular acceleration. It is also known as transverse acceleration or azimuthal acceleration. 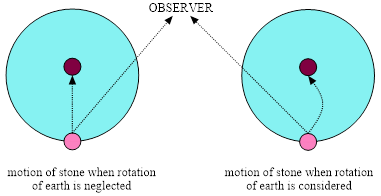 Imagine earth to be stationary devoid of any rotation as well as revolution and you are throwing a stone. What would be the path followed by that stone? The stone will move along a straight line path! Now, consider the motions of earth. This time the stone will follow a parabolic path! It is the rotation of earth due to which the stone appears to be parabolic in nature. Before moving on to describe this strange behavior I would like to discuss about “Coriolis Force”. What is this force all about? And how it affects various phenomenon on earth surface? In the atmosphere, the earth’s rotation results into coriolis force. This coriolis force acts as an apparent force. The coriolis force acts towards left in the southern hemisphere and right in the northern hemisphere. At the equator this force becomes zero. Circulation of wind is one of the natural applications of Newton’s laws of motion according to which air will move constantly in straight line unless it is compelled by an unbalanced force. The coriolis force provides an opposing pressure gradient acceleration which changes the direction of moving air. 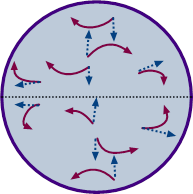 Ideally wind should blow directly from high pressure to low pressure but the rotation of earth deflects off the wind from the original path unaffecting its speed. The rotation of the earth forces the latitudes to travel with different speeds. This variation in speed of latitudes causes coriolis force. The coriolis force has no effect on the wind speed but only on the direction of propagation of wind. Many natural phenomenon can be explained with the help of the concept of coriolis force. For instance, consider the case of hurricanes. The circular motion of the circulation of the hurricanes is because of coriolis force which come into play. Tornados also appear to be the applications of coriolis force but actually are not. A tornado is so small in dimension as well as in duration that coriolis force doesn’t affect it. Sir, plz provide previous year question with solutions. Thanks for writing us. We are working on your request and will get back soon. Stay tuned with us.